The Champions Circle is a great place to be, especially when you’ve got a top performing retail strategy. 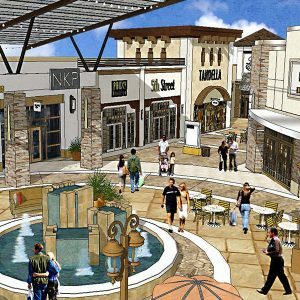 Tanger Outlets new Ft Worth location will open in November of 2017 with an anticipated 95% occupancy. Although the 44 acre shopping center has been in the works for years, it wasn’t until Tanger (ticker: SKT) hit 60% commitment from potential retailers that Steve Tanger, CEO, decided to go forward. The 350,000 sq ft retail outlet is located across from Texas Motor Speedway and occupy the “Champions Circle” area next to Buc-ee’s Travel Center. Not only is shopping a bonus for visitors to the speedway, it represents a $2 billion source of income for the greater Ft. Worth area. The retail outlets will reach shoppers up to 50 miles away. In addition to the income from shoppers when the development is complete, the Tanger Outlets project will also bring 400 construction jobs. The shopping center will employ 900 full- and part-time employees and will create about $100 million in new tax revenue for Fort Worth and Denton County. Crystal Structures is pleased to be a part of this development. We’ll be providing eight 16′ x 22′ standing seam polycarbonate skylights that will be used as canopies over the open walkway areas. This is not only a decorative feature for the shopping center, it will also provide cover in the event of inclement weather.